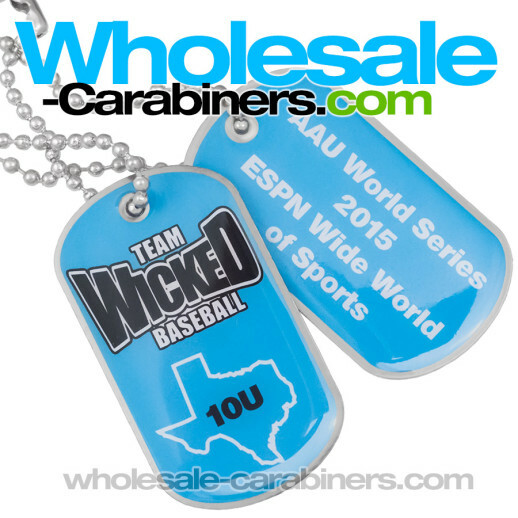 Dog Tags: Full Color on Stainless from 69¢! Do you have a highly detailed, UNLIMITED full color image that you also need to have reproduced a a custom metal dog tag? If yes, these are the perfect choice. The reproduction of graphics on these is simply amazing, the detail level is very high, and they are finished off with a clear coat that makes them glisten, and also protects the artwork. These standard size dog tags measure 1.125 inches x 2 inches. We can make them with the metal border showing, or, we can print right to the edge, full bleed. With no extra charge for "extra" colors, these can also be one sided or two. Included in the pricing is either a 30" neck chain, or key ring at a further discounted price.